WANROOETECH's PNMF series pulverizer’s main engine and also the main structure are adopted the Germany latest advanced technology and our own experience,these years WANROOETECH teams's great effort in development. The plastic granules of virgin or recycled grinded scraps size range from 6mm to 10mm can be milled into powder at the high-speed rotation of the mill via a magnetic vibrating feeder. 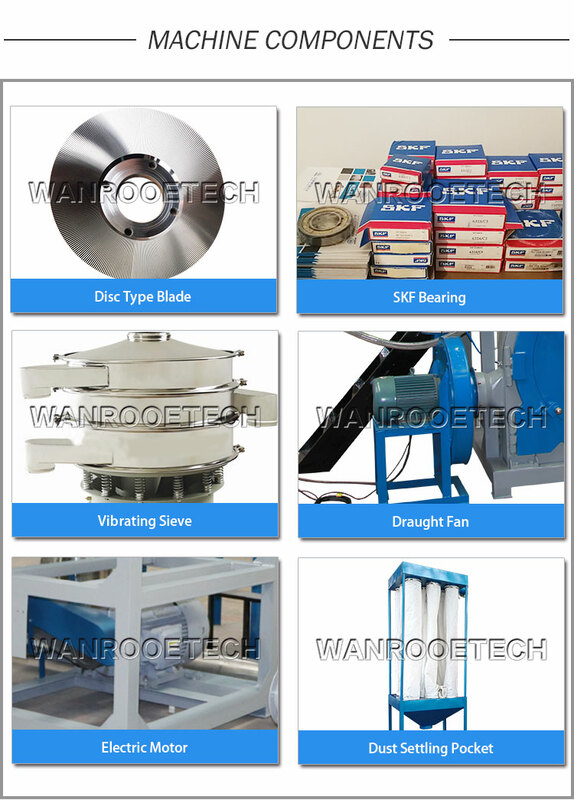 The size of the end powder, particle size distribution, the mobility can be regulated by adjusting the space bewteen the stationary grinding disc and rotating disc.The complete set of pulverizer is equipped with temperature controlling device and stainless steel pipe system, vibrating screen, automatic feed device, and also the dust catching system etc. The quality grinding discs include the full circle one, and the split type, which can be tailor-made according to the needs of users. 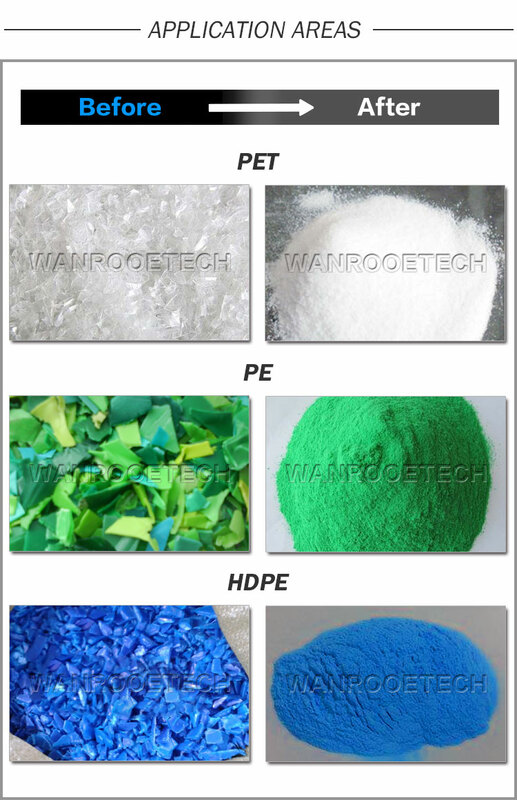 Typical applicattion material detailed as:LDPE，HDPE，UPVC，PC and various other plastics. WANROOETECH＇s PNMF series pulverizer has the features of extremely high output, lower consumption, compact size design which take less workshop area, which can be equipped with a automatic temperature control(optional). The material to be pulverized is fed centrally between a stationary and a high speed rotating grinded disc, and because of the centrifugal effect, that carries the grinded material through the processing zone before being discharged with the machine pneumatically. The pulverizer operate without an internal screen and the particle size of the product is determined by the type of material being processed, the disc construction and the processing gap between the discs. According to final product requirements of customer a screening machine with a feedback unit can be simply incorporated into the pulverizer system. ●Low energy consumption, and high output. ●Simple to operate and install. ●There is disc adjustment device, which can allow you to adjust the gap between the stationary disc and rotating disc, finally to control the powder fineness, and meet different needs. ●The main engine has a water cooling system. ●The high-quality blades are easy to replace and can be used for several times after regrinding. ●The disc material are adopted alloy steel with HRC up to 63, which are wear well or durable in use.